Growing up in Philadelphia where cheesesteak is the signature sandwich I like to think I'm somewhat of an authority on how it should be made. Thinly sliced rib-eye steak is the meat traditionally used to make this delicious sandwich. If you can't find rib-eye sliced thin a trick is to partially freeze a thicker piece, which will make it easier to cut and pound to desired thickness. The type of cheese used in a cheesesteak is equally important as the meat. Most people would say cheese wiz is the cheese to use. I'm not even sure if wiz can be considered cheese, but that is a topic for another post. My cheese of choice is provolone. Bread is the final component. A cheesesteak should be served on a long thin roll which is not too soft but definitely not hard. 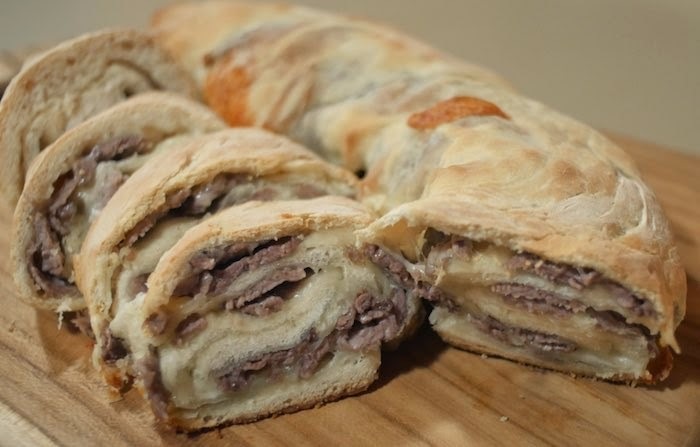 Since moving to Arizona I have not been able to replicate the bread to make the perfect cheesesteak so when I'm craving one I will usually do a Stromboli instead. For those of you that aren't familiar a Stromboli is pizza dough filled with ingredients rolled jelly roll style and baked in the oven. Season rib-eye with salt and pepper. In a large skillet over medium-high heat, add the beef and cook until brown, shredding the beef with tongs or a spatula as you go. Once cooked, remove from the heat and allow to cool before making the Stromboli. On a clean, dry work surface sprinkled with flour, roll out the pizza dough. Once the dough is rolled out, lightly oil it and season with salt and pepper. Layer the sliced cheese, leaving a 2-inch border on all sides and top with the cooked beef. Roll jelly roll style and place on a sheet pan. Bake until brown, about 20 minutes. Remove from the oven and let rest for 5 minutes. Cut and serve. Now THIS is a cheesesteak done right! Woah. My hubby would love this! Wow, fun idea. I like that it can be picked up and eaten like a sandwich or pizza but has its own special, more sophisticated quality. Provolone, yummy. This looks like something I grew up eating in NY. yum. i love a good cheesesteak and making it into a stromboli is a great idea. This looks like it has the perfect ratio of bread to "stuff"
This would be great for a Superbowl Party, yum! Oh goodness! My mouth just watered up!! I love it! OMG, this looks SO GOOD. Pinning. That looks like perfect Super Bowl food! I am bookmarking this for the big day. Oh wow! My husband would love this! Yes,I could definitely get on board with eating this. Wow, this is something that my husband would really love. You had me at cheesesteak...and in a stromboli?!? Oh.My.Gosh! Mmmmm...oh yeah, this looks good. I can smell it from here! Thanks for not using cheese wiz in this. Even if it is traditional the stuff creeps me out. I love strombolis! I remember my grandma making a pizza version and loving it. I will definitely have to try this cheesesteak version! I am no cheesesteak expert - but I know what I like...and I would really like this! This sounds and looks so tempting. That's one tasty looking stromboli!! Yum! This is absolutely gorgeous and I want to devour it. I'll enjoy some rib eye steak any day! There would be no leftovers if I served something like that stromboli. There might even be some fights over who got the biggest piece! I love this. I'm a huge fan of cheesesteak anything. Whoooa. This sounds like an amazing dish! Cheesecake done right!! Loved that you turned it into stromboli !! Also a native Philadelphian, I am very, very particular about how my cheesesteaks are made and served. this one most certainly gets the OK! Looks delicious! Perfect for game day! My son loves cheesesteaks so I am going to have to make this for him. Good ole Philly cheese steaks! Happy new year! This looks perfect for our cold snowy weather! Cheesy, meaty and delicious! I love all things cheesesteak and this will definitely be on my families dinner rotation this year.